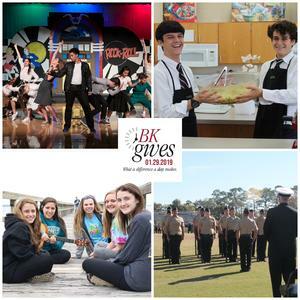 Today is #BKGives—a 24-hour day of giving project held during Catholic Schools Week. This year, we have set a goal of 258 donors and $10,000 in 24-hours. All gifts made on this day will be directed to the Fund for BKHS. The challenge is this: Visit http://bishopkenny.everydayhero.do and participate with your decade or group! We are asking all alumni to contribute to their respective decades and all parents, staff, faculty and friends of BK to donate through the Parents + Friends of BK page. Please encourage your friends to do the same by word of mouth and/or sharing your #KennyPride on social media (Facebook, Instagram, Twitter, etc). The goal is to secure 258 gifts from alumni, parents, friends, faculty, and staff of BK. It’s all about the numbers! If we increase the number of supporters, the dollars will take care of themselves. Note: If you are unable to give, please remember the BK Community in your prayers—we need those too! Be one of the 258 donors that helps us reach or exceed today’s #BKGives goal of $10,000. Click HERE to give now!